14 years after his masterpiece Beat of the Drum Whoop of the Dance went out of print, Forrest Fenn has updated the book and has published a revised edition containing 200 new images. He has kindly given us permission to extract from his grand Teepee Smoke: A New Look into the Life and Works of Joseph Henry Sharp. Containing newly discovered paintings and photographs from old private collections and museum basements, the new book with its glorious images and drawings represents a treasure-trove for the Sharpe collector. Last time we left our master painter Joseph Henry Sharp, he was sailing to Europe in 1881 to refine his artistic style. J. H. Sharp, La Neophyte, oil, 40 x 30"
COLLECTION OF THE BUTLER INSTITUTE OF AMERICAN ART, PHOTO COURTESY BUFFALO BILL HISTORICAL CENTER. Unlike most American artists of the time who studied in Munich, Pares or The Hague, Sharp chose on his first European trip to study the Antwerp, a city whose magnificent Gothic architecture reflected a vibrant and varied history. During the Renaissance and Reformation, Antwerp had nurtured many of the world’s great Flemish and Dutch masters whose sense of humanity and use of common people as subjects of their paintings had a marked influence on later French painters. Antwerp was also the home of Peter Paul Rubens (1577-1640), whose masterpieces hung in the city’s great cathedral and in the world-renowned Musée des Beaux-Arts. Sharp revered Rubens for his experiences with color and light and for his ability to express a tremendous sweeping energy and dramatic tension in his paintings. Sharp chose to study with the renowned portrait painters, Charles Verlat (1834-1890), at the Antwerp Academy of Fine Arts because, like most artists of the time, he would have to earn most of his living painting portraits. He studied in Antwerp for a year and afterwards traveled to Brussels and then took brief excursions to France and Germany before returning to Cincinnati in 1882. 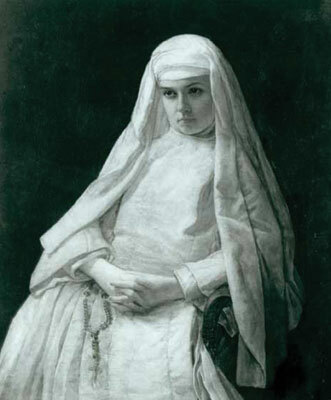 Unlike Duveneck, Sharp did not return with a handful of medals and awards, but he did come back with confidence in his ability and the determination to become an important artist. His first task was to locate a studio, and to this end he looked up his friend and former teacher, Henry Farny. Farny was a gregarious and openhearted man who especially enjoyed entertaining friends and lent them money when they were in need, even at the risk of neglecting his own financial affairs. He made Sharp welcome and wanted to hear about his experiences abroad. Farny himself had only recently returned from the Munich Academy, so the two had long conversations about current art movements and techniques and about the difficulties of trying to make a living as an artist. The slips of paper Sharp was never without passed back and forth endlessly. At Farney’s suggestion, Sharp rented a studio at 30 West Fourth Street, the same building in which Farny had had his studio. Located several flights up, the particular room that Sharp rented had been occupied earlier by Thomas Buchanan Read (1822- 1872) and would later serve as the studio of Worthington Whittredge (1820-1910), Clarence Bartlett, Thomas S. Noble (1835- 1907), Louis Lutz (d. 1894), and Lewis H. Meakin (1853-1917). 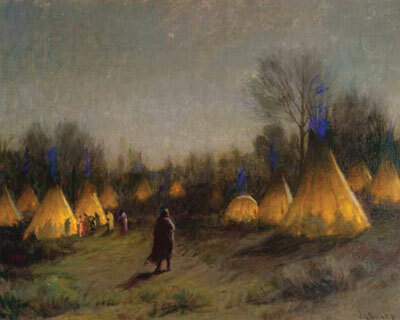 Sharp’s credibility as a professional artist was enhanced now that he had spent that important year abroad, and during the next year he was able to save enough money from portrait commissions to plan a trip to the Western frontier. Sharp was not alone in his attraction to the romance of the West: dime-store novels about gunslingers, cowboys, outlaws, and Indians were best-sellers. Frequently, the truth as reported in the newspapers was even more incredible that the fictionalized accounts. Less than two years before Sharp traveled West, Billy the Kid had been shot to death by Sheriff Pat Garrett at Fort Sumner, New Mexico. Three months later, the Earp brothers and Doc Holliday had faced the McLaurys and the Clantons at the O.K. Corral. Apaches still roamed the hills, and newspapers reported with disturbing regularity their attacks upon ranchers and prospectors who were unlucky enough to be caught alone in the wilderness. J. H. Sharp, Squaw Winter-Crow, oil, 30 x 28"
Sharp’s interest in the West centered on the Indians, and he yearned to study their cultures and to paint their portraits. He told Farny about his ambitions, but Farny was cagey in his response. Farny had found the market for paintings of Indians quire lucrative; thus he was less than eager to share the market with another artist, especially one of Sharp’s ability. Farny tried to discourage him, pointing out the overwhelming difficulties and chilling dangers of the undertaking—a man, after all, could get killed out there; it was still wild country, and travel was very hazardous. But Sharp had made up his mind, and Farny realized that he could not dissuade him. With reluctance, he gave Sharp books about the Pueblo Indians. 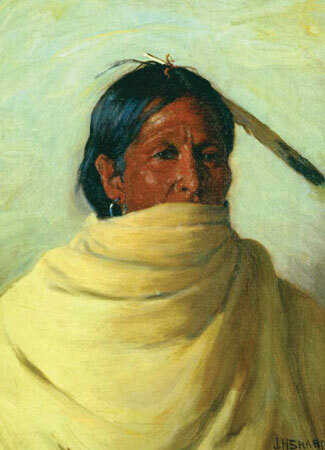 Farny’s subjects were generally the Indians of the plains. And he also told Sharp about a secret sect in northern New Mexico, the Penitentes, whose members performed bizarre religious rites. By the end of the year, Sharp had enough money to begin planning his journey, and by the late spring of 1883, had completed all the arrangements. He closed his studio, bade Farny goodbye, and eagerly headed West. The Atchison, Topeka and Santa Fe Railroad left Cincinnati bound for Chicago. From there the line dropped southwest across the fertile farmlands of Illinois into the rolling hills of Missouri, then out across the grassy plains, terrible with the summer’s heat. In the distance, the traveler could see herds of grazing cattle and small bands of horses, and occasionally, a small herd of buffalo or a lone Indian on his pony, watching silently as the train passed by. The sod huts of early settlers scarred the plains, most of them crumbling from long disuse but a few had doorways that framed the faces of curious children who stared in wonder at the giant steam locomotive and its long line of cars bound for places unknown. 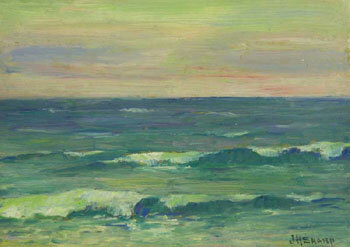 J. H. Sharp, Seascape, circa 1930, Oil on Board, 9" x 6.5"
In western Kansas the land began to swell like an ocean in a gathering storm; great mounds and strange shapes rose and then fell back to the horizon in an endless wash of colors—burnt orange, siennas, red-browns, and a diversity of greens, bright yellows, lavenders and blues. Huge piles of rock, formed by millions of years of erosion, studded the hillsides. Across the corner of southeastern Colorado and down into what is now New Mexico, the land gradually became a wilderness of twisted fullies, endless ruts, dried river beds, and occasional ponds glistening under the hot, silent sky. The ruggedness of the country inspired Sharp, and he thought about the passage of time and the myriad bands of people over thousands of years who had roamed this vast, desolate land, leaving little, if any, sign of their presence. The mountains and clouds at first rippled like purple waves on the horizon, insignificant against the huge sweep of land and sky; to the left, the skies gleamed brightly in the sunlight; far to the right, clouds and rain formed a high, dark, ominous curtain. The train traveled on, up and down, winding along steep and flattopped mesas until at last the mountains looked large and the horizon became a stormy struggle between thunderhead and mountain peak. When the train stopped at Galisteo Junction (Lamy) in the New Mexico Territory, Sharp wearily disembarked, stretched his legs, washed the dust from his face, and went looking for a place to eat. He didn’t have to look far, as the town consisted of a hotel and saloon, a few adobe houses, a tienda (store), and a church. After a good meal, he boarded a train that crawled the spur track to Santa Fe, which in 1880 had a population of 6,635 people. At the end of the track he found a settlement crowded with old churches and low adobe houses. The business district consisted of several trading posts, a bank, a couple of hotels, and three or four saloons in which the noise of drunken celebration was punctuated by the report of gunshots in a blue-black atmosphere reeking of cheap whiskey, stale coffee, sweat and violence. Across from the mud-walled Palace of the Governors, the dusty plaza teemed with activity: bearded rough-skinned traders sat atop loaded freight wagons harnessed to weary mules; Indians traded and sold hides and goods brought in from the pueblos; and cowboys lounged about while their horses slept standing at the rail, swatting at flies with their tails. Impatient to see as much of the West as possible, Sharp stayed in the Santa Fe area only long enough to learn about the pueblos of the Rio Grande, particularly the great Taos Pueblo and its nearby Spanish village. He contented himself with a few sketches of the area and its people before taking a stage to Albuquerque, where he boarded the narrow gauge train to Tucson. Because the open cars were not intended for passengers, the trip was dusty and uncomfortable. Passengers ate at the stops along the way, but there was seldom enough food because a cavalry detachment pursuing Apache warriors led by Chato had recently passed through the area and requisitioned almost all available supplies. Sharp lived primarily on crackers and water on this leg of his journey. From Tucson, he traveled by the standard gauge railroad to California, where he boarded a ship that sailed up the coast. After it ran aground at the mouth of the Columbia River, Sharp decided to stay on land and explore the Northwest on horseback and by stagecoach.